Our latest pelagic trip left Wildwood Crest on Friday night. What a difference from the last trip. 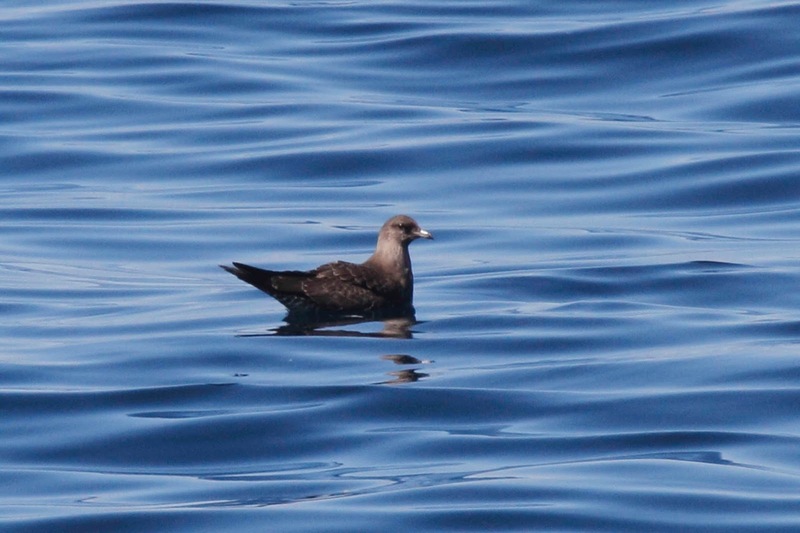 The seas were calm and we saw a good number of birds and other sea life. Our first treat was to witness the LADEE rocket which launched from Virginia at 11:27 PM. The entire horizon lit up and then we watched the rocket climb, climb, climb until it went out of sight. That was really cool. After a restless night sleep on the top deck of the 95' Atlantic Star, we had a beautiful sunrise and 3 species of storm-petrals - Wilson's which you have read about in previous posts, Leach's, and Band-rumped. 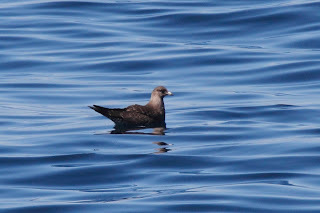 We also saw a few Shearwaters which we have seen on other trips too. 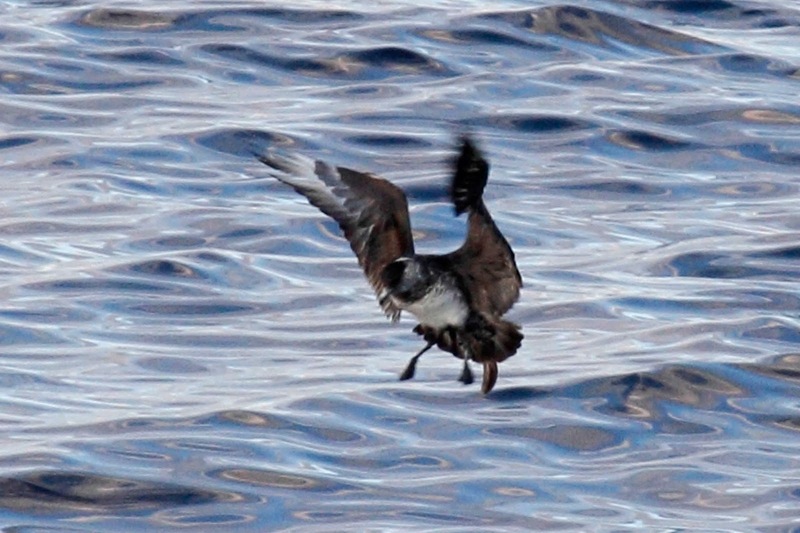 The best bird of the morning was a Pomarine Jaeger that circled the boat a few times. This is a big bird which makes it's living stealing meals from gulls and terns. The ID on this bird is that it has long tail feathers coming out of the center of the tail. 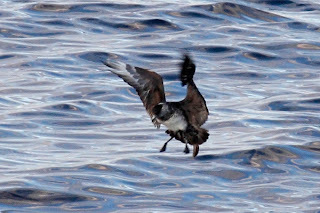 You can see that on this photo of the bird trying to land on the water. 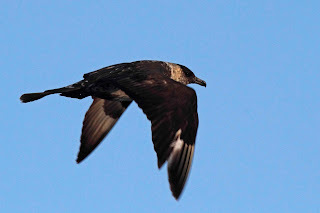 You can also see the long tail feathers on this photo of the bird flying past the top deck of the boat. They just look menacing don't they? 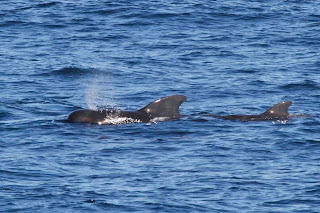 We didn't see other birds for awhile but did get to see cetaceans (whales and dolphins). 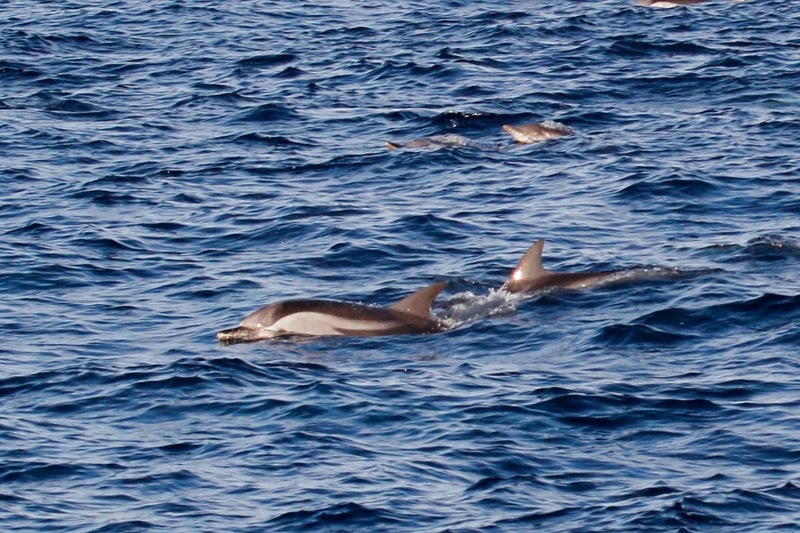 Here are a few species - Culvier's Beaked Whale, Pilot Whale,Striped Dolphin, and Common Dolphin. Here are a few photos. 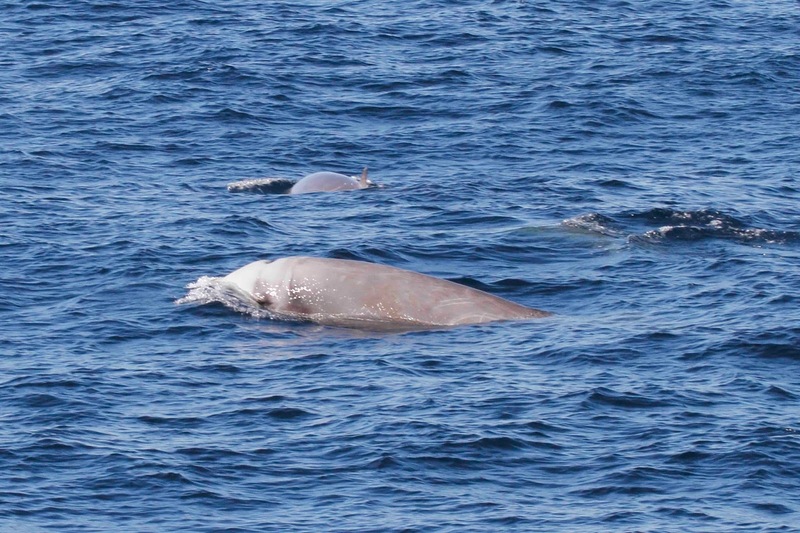 This is a male Cuvier's Beaked Whale. You can tell by the gray head. 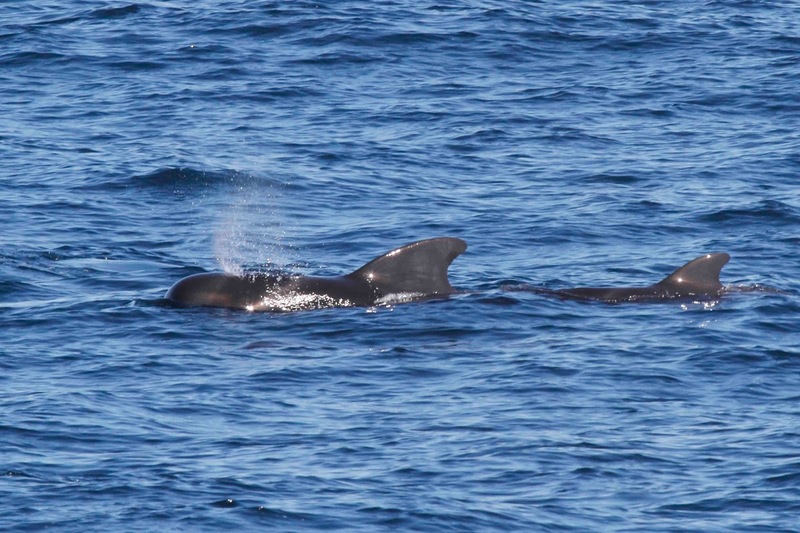 Here is a Pilot Whale which are actually just really large dolphins and not true whales. You can ID these by the black color and bulbous head. 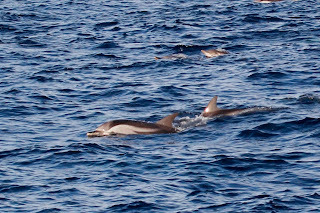 Striped Dolphin are pretty rare - so says our trip leader. 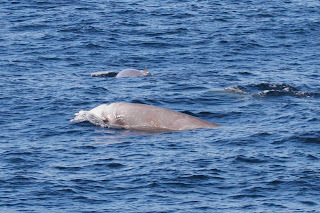 We saw a pod of about 30 or more. Back to birds with another Jaeger. This one is Long-tailed Jaeger which was a life bird for me. This is a juvenile which doesn't have a long tail yet. This guy hung around for awhile before flying off. 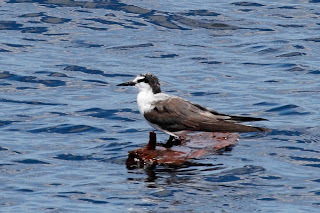 The most unexpected bird of the day was this Bridled Tern - a southern species. 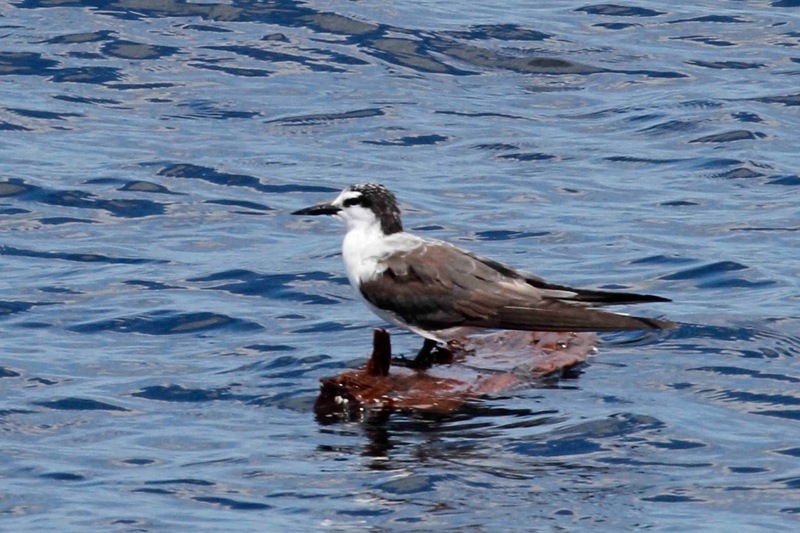 This bird found a floating piece of wood to rest on. It didn't seem to mind the big boat riding past either. 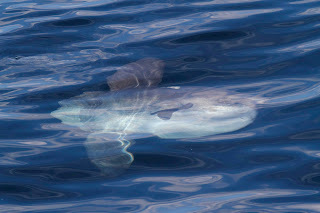 The weirdest sight of the day was this Ocean Sunfish or Mola Mola which hung around the boat for awhile. This fish is shaped really funny with 2 big flippers, practically no tail and a face that looks human. The fish is really big - about the size of a Lazyboy recliner - and weighs about 600 pounds. Click on the photo for a larger view to see what I mean about the face. Here it is looking up at me from beneath the water. It freaked me out a little bit. 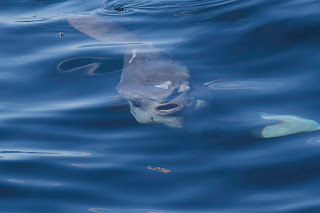 We returned to the dock at 5:15 PM on Sat with a bunch of new species to add to the stupid contest list, some funny stories and an image of Mola Mola staring at me. By 5:30 half the people from the boat were all in our cars and off to chase another bird for the contest - Lark Sparrow which was seen by all. Part of the fun of these trips is meeting new people and seeing them on subsequent trips. By the time the boat pulls into the dock, you feel like you had a shared life experience with the other participants. You even feel like you can invite them to dinner or to stay as a guest in your house, which is exactly what happened. I ended up with 3 guests which was great.